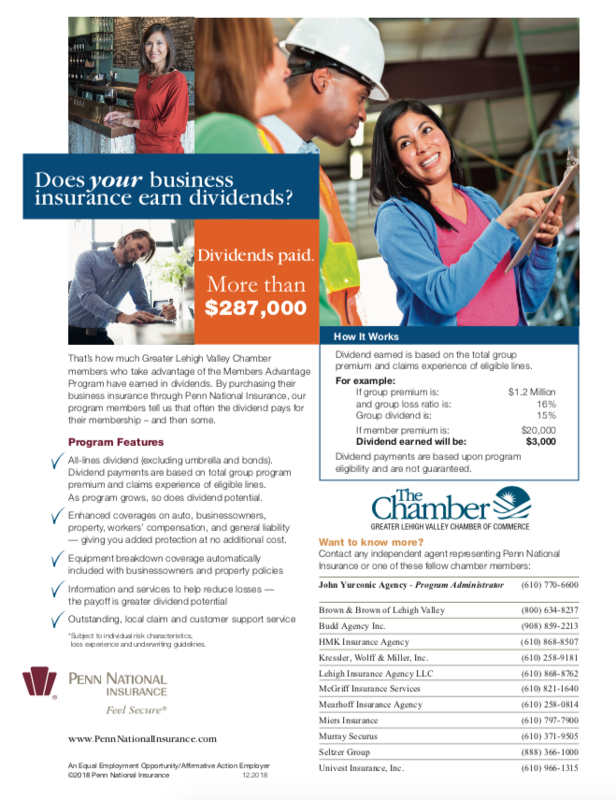 Penn National Insurance has announced a 6% dividend for the Lehigh Valley Chamber of Commerce Business Insurance program members, bringing the total dividends returned to the business community to over $177,000. Over 10 independent agents representing Penn National Insurance are members of The Chamber and would be happy to discuss your insurance needs. Don’t miss out on this important member benefit. Participating brokers: John Yurconic Agency / Brown & Brown of the Lehigh Valley / Budd Agency / Hampson Mowrer Kreitz Agency / Kressler, Wolff & Miller, Inc. / Miers Insurance / Murray Securus / Seltzer Group / Sterner Insurance Associates, Inc. / Woodring Roberts Corp.
Click here to download flier with complete program details.